Chocolate Sponge, Marshmallow Fluff Buttercream Frosting, Toasted Marshmallows and Crushed Biscuits make the ultimate S’mores Cake to end all S’mores. Easy, Delicious, and Sweet…yum. 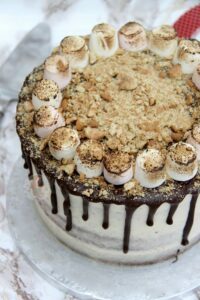 I’ve been wanting to make a S’mores Cake for a good while now, but I knew I should wait till Autumn and Halloween/Guy Fawkes time to post it. Bonfire Night is great, and I always make an awkward UK version of S’mores with Digestives, but it’s still damn delicious. 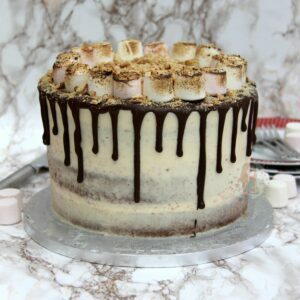 What can you not like about Marshmallow, Chocolate and Biscuits all smooshy and melted together? YUMMY. Like seriously, it’s not necessarily for the people who don’t like very sweet things, BUT OH MY DAYS ITS DELICIOUS. 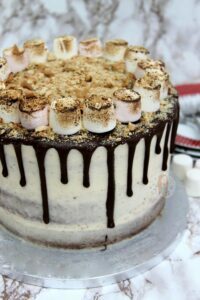 I went for a Chocolate Cake to keep with the theme of Chocolate and Marshmallow together, but you could easily just make it a plain sponge instead by using 400g of Self Raising Flour and removing the Cocoa Powder from the recipe. It depends on what you like, but I was craving Chocolate so. I used the same sponge recipe as I did the other day with my Halloween Drip Cake, but that’s just because I love it. Notes below in the ‘Tips and Ideas’ section about how to make a smaller version! I then based the buttercream recipe on my S’mores Cupcakes post. However, instead of just doubling the recipe, I decided to still only use one tub of Marshmallow fluff so that the recipe wasn’t too slack. I’ve tried it in the past and I wouldn’t say it the best for covering the sides, so only using one tub made it the perfect amount. Just sweet enough as well! I realise that this recipe is slightly lacking in the biscuit department, but I wasn’t too sure on how else to introduce it to the mix. American recipes I have seen have used graham crackers in the sponge mix, but I wasn’t sure how well this would work with Digestives. 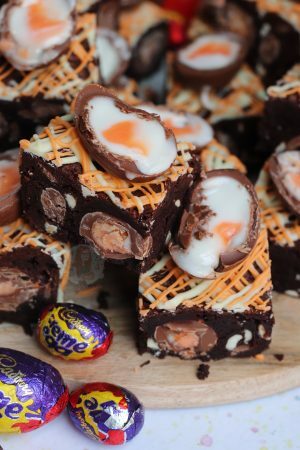 You could add biscuits between each layer, and some mini marshmallows if you like, but I reckon the biscuits might go soggy whereas the ones on top of the chocolate don’t. It’s up to you, but the cake is delicious as it is either way. 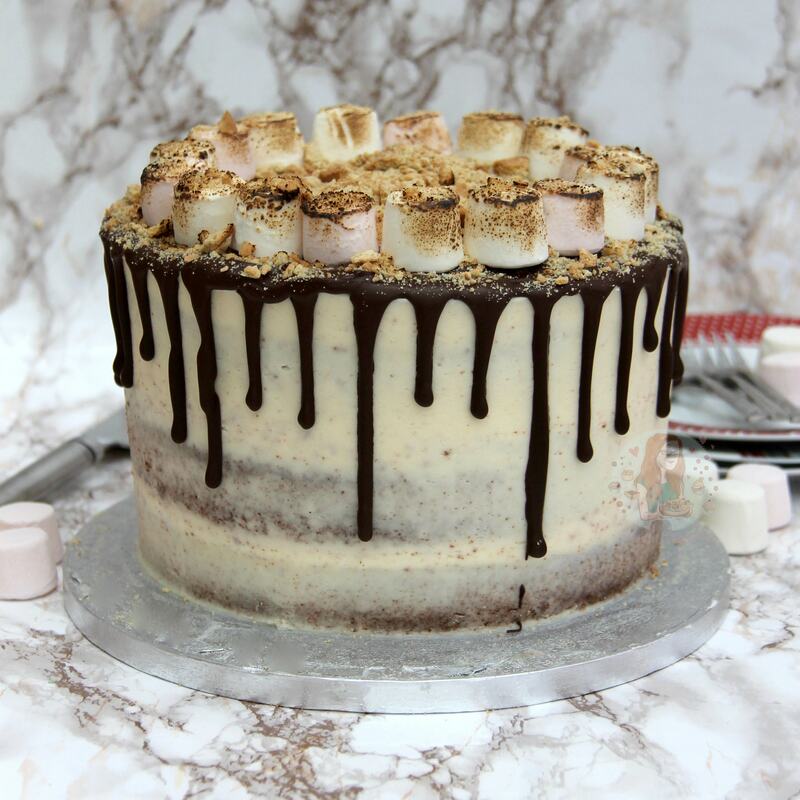 I think after the success of my Oreo Drip Cake, I reckon you’ll adore this too. 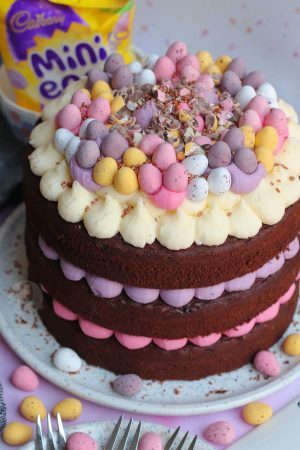 I like the idea of a Semi-Naked cake, so I never have the thickest amount of buttercream on the sides, but as you will naturally have a little leftover if you do the scraping method, you can just slather it back on to use it up again if you wish. I tend to eat the leftover Marshmallow Fluff Buttercream Frosting with some spare digestives and such… my bad… but jeez its so delicious! 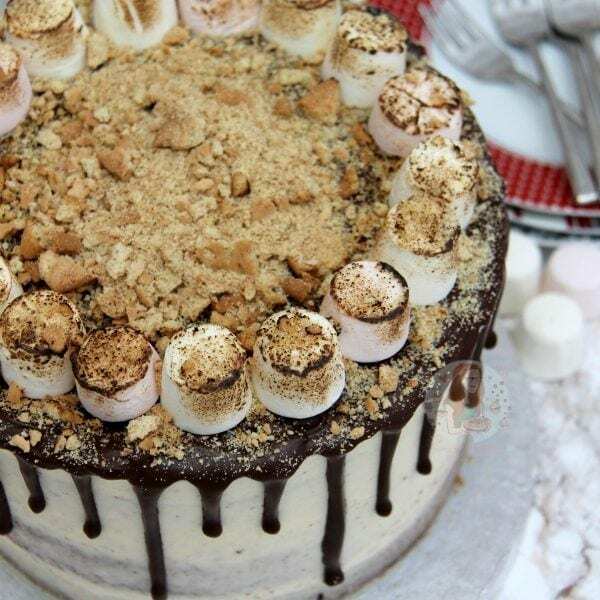 Chocolate Sponge, Marshmallow Fluff Buttercream Frosting, Toasted Marshmallows and Crushed Biscuits make the ultimate S’mores Cake to end all S’mores. Add in the flour, cocoa powder, beaten eggs, baking powder and beat again briefly till combined – try not to over beat the mixture! Add in the tub of Marshmallow Fluff and beat again – till wonderfully combined! Once the cakes are cooled, put the first layer on the serving plate spread some of the buttercream onto the top of the first layer, add the second cake on top, and then top again with some of buttercream and then add the final sponge layer. Only use about 2-3 tbsps of buttercream per layer so that you have enough to decorate with! With the leftover buttercream, as you can see, I covered the sides (and top) too! Do a first layer of around the edge and top using a large metal scraper and refrigerate for 10 minutes. Repeat again with a slightly thicker layer of buttercream. I slather it on all over using an offset spatula and then run the metal scraper round until its smooth. You put more on compared to what will stay on because when you smooth it over, you will naturally scrape some back off again. Refrigerate the cake for about 20 minutes (if you can) to firm it up. Once finished, melt the Dark Chocolate in a heatproof bowl until melted. Add in 1tbsp of oil and beat till smooth, continue to add oil till you get to a drippy consistency. I use 2tbsps of Oil for Dark Chocolate drips, but some chocolates might need more or less. Using disposable piping bags, pipe it around the edge of the cake, edging over slight bits to create the drip. You don’t need to use too much per drip as it’ll drop quite far down by itself! Fill in the top in with the rest of the chocolate so the top is also covered. 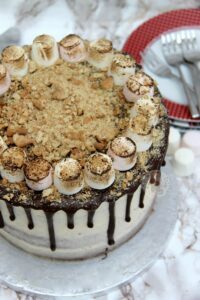 Add some larger marshmallows around the edge of the top of the cake and toast them slightly with a blowtorch for a bonfire marshmallow effect. Crush over some biscuits and leave the chocolate to finish setting! Enjoy! You can tell the cake is cooked because when its not done it’ll make a bubbling/crackling sound, whereas when it is done, the sound will have stopped! You could add in some mini marshmallows between each layer, as well as some biscuits if you like to make it extra S’moresy! Use 2/3 of the decoration recipes! Find my other Cake & S’mores Recipes on my Recipes Page! Older Next post: Pumpkin Spice Cupcakes! Newer Previous post: Bonfire Night Chocolate Bark! I’ve always found it in supermarkets near nutellas and such, but I’m afraid I’ve never tried with melted marshmallow. I’m unsure if it’ll work as it will probably just melt the buttercream! Ahh yeah, I’m right on the southcoast of england but have it in Tesco and probably B&M as well as other stores so maybe they just don’t sell it as much near you! 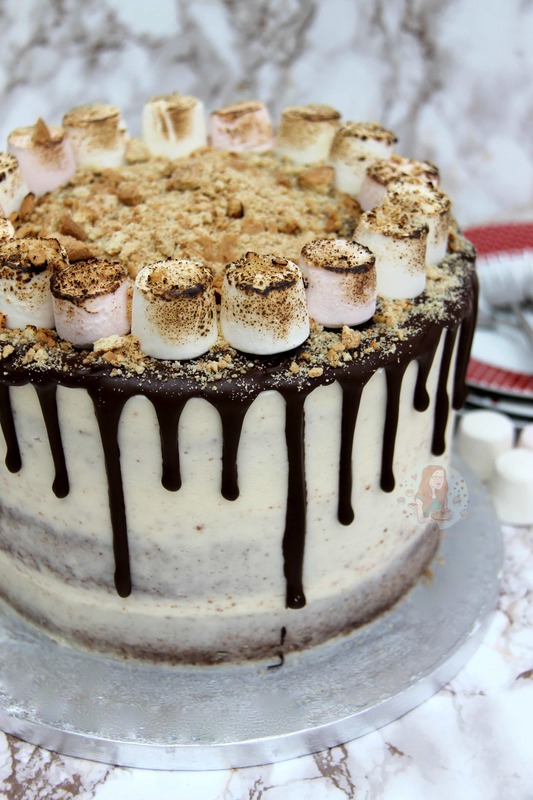 But vanilla buttercream would be fine, just add some mini marshmallows in between each layer or something! I live in a small town in the north east , so proberly why I can’t find it. That’s a great idea thank you. 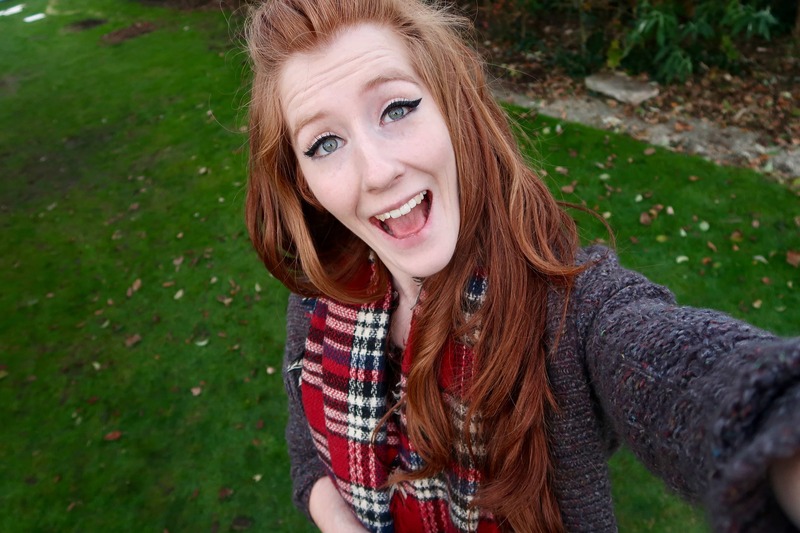 Hi Could you make this in two layers instead of three? Yep! Notes on how in the tips section. Hi I was wondering if we are making a smaller cake with only 2 8″ tins do we still need to use 8 eggs or less?? You can use milk chocolate but you need to use half the amount of oil as its naturally thinner than dark chocolate. & I have a drip cake video on my youtube channel! 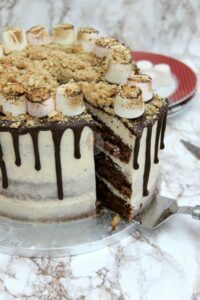 Hi There, I am wondering how much I should increase the ingredients if I am using a 9″ cake pan? 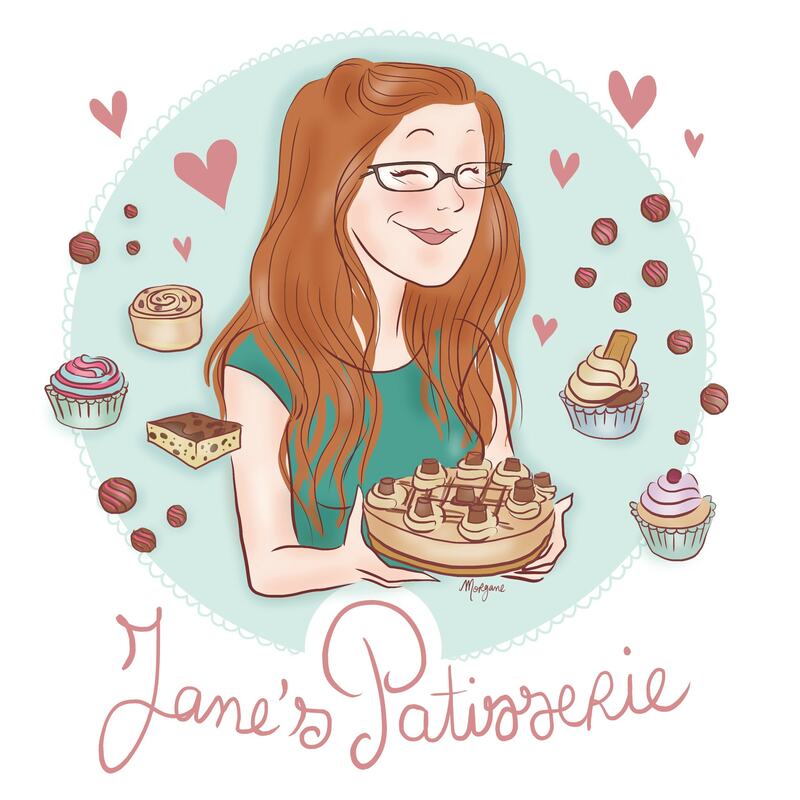 Yes this website for conversions – fill in the details and the two different cake sizes and such and it’ll tell you the new ingredient amounts. sorry, I don’t see a website? Hi, can you tell what marshmallow fluff consists of so I can try to make or buy a substitute in Australia please? I would recommend googling it ? Its a marshmallow spread basically. 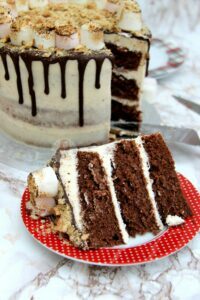 Hello, this chocolate cake looks delicious! Just wondering as this would make 3 x 8″ layers. 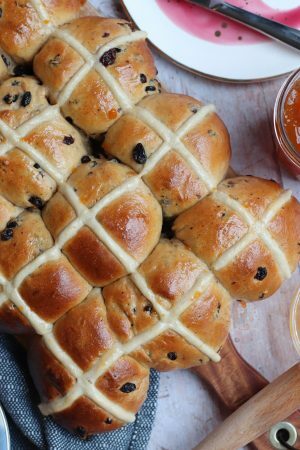 How can determine what size square pan I can use to bake it? Love your blog! Perfect! Thanks so much ?